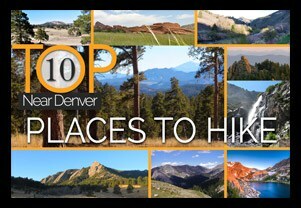 Green Mountain in Boulder, Colorado is a strenuous hike that offers fantastic views of the Front Range, Flatirons, and a wide panorama at the top of Green Mountain. The trails around Chautauqua park offer a several options to summit Green Mountain, letting you take your trail of choice, but in the trail profile below, we’ll point out the most direct route. 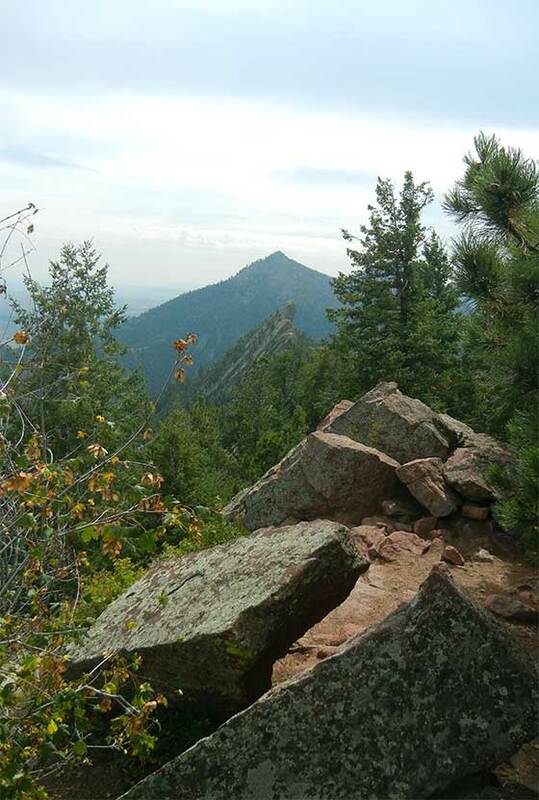 Explore the full Green Mountain hike profile below for trail map, driving directions, and all the details you need to conquer this hike near Boulder. Parking was EXTREMELY busy when I visited on a Sunday morning, I had to park along Baseline road and many people were parking along residential streets. Don’t be turned off by this though, many come for the lower hikes, and visitors noticeably thin off as soon as you enter Gregory canyon to make your way up to the summit of Green Mountain. Gregory Canyon has its own trailhead parking area which requires a fee. The 2013 flooding has closed the Gregory Canyon parking lot, but it’s a small lot anyway and most hikers will need to park along the road as I did–unless you plan to hit the trail before 7am. 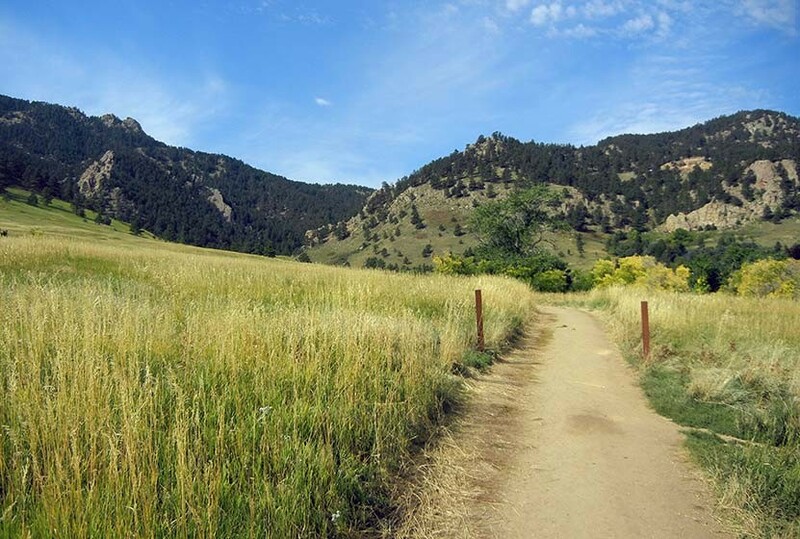 You can also begin your hike at Chautauqua park, and take the ski jump trail to the bluebell trail which will lead you to the Gregory Canyon trailhead. 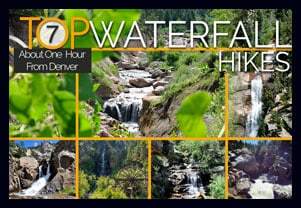 This will add 1.2 miles round trip to your hike, but will afford you great views of the Flatirons at the beginning of the hike. Another option is to park along Flagstaff road near Realization Point, and to completely bypass Gregory Canyon and take only the Ranger Trail up. However, this trail profile of Green Mountain will feature a loop hike taking the following trails: Gregory Canyon to the Ranger Trail to the Summit, returning via the E M Greenman trail, then back down via Saddle Rock for a total of around a 5.5 mile hike. See the map link above to get a visual of the route. Starting at the Gregory Canyon trailhead, you’ll notice that the first portion of the hike is very sun exposed. However, the Gregory canyon and Ranger and Greenman trails are probably ~80% shaded. There is some flood damage from 2013 floods, but the trail markings have been updated and are very clear (just make sure you read all posts at each intersection). 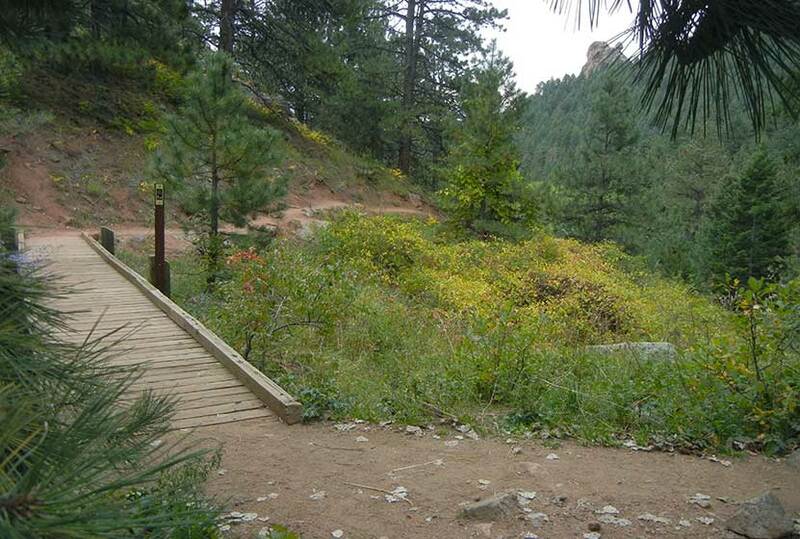 The Gregory Canyon trail, like many others in the Chautauqua park area, has an orchard-like aroma because of all the flowers and fruit growing along the trail. I noticed several families with children hiked Green Mountain from the Flagstaff Rd parking area, but noted that the smaller kids had to be carried at some points. 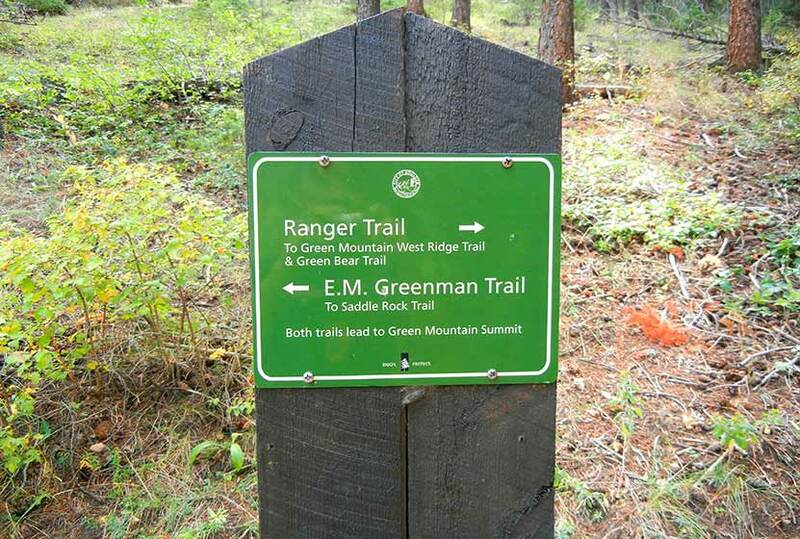 For Summiting Green Mountain you have two choices, Ranger or Greenman. Ranger has more carved steps and is mostly switchback in nature. Greenman seems to be fewer switchbacks, in favor for a more gentle climb. For this loop hike, take the Ranger trail up, and descent via the Greenman trail. 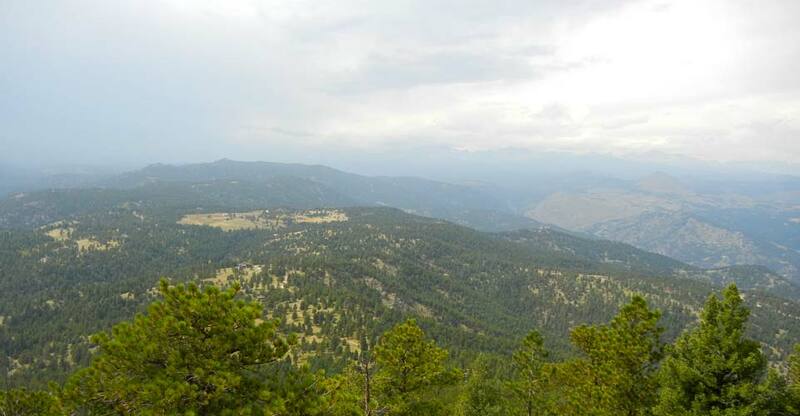 The summit of Green mountain gives you a panorama view to both into Boulder in the East, and to the Rocky Mountains in the West. 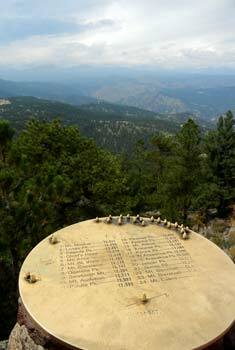 There is a unique bronze disk set into the granite at the summit. It points out and identifies the different peaks in the distance. 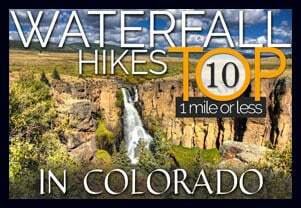 Most of the year, except in July through most of September, you’ll be able to take in the snow-capped ridges and peaks of the Indian Peaks Wilderness area. Of course, you could descend the way you came, but why not take in some new trails and views. You can make this a loop hike by descending the Greenman trail. After about 1 mile, the trail will intersect with the Saddle Rock Trail. Take the Saddle Rock Trail back down to the Gregory Canyon Trailhead. We want to thank Joe Quintana, a member of our Dayhikes Pathfinder Team, who hiked Green Mountain, gathered the information for the trail profile, wrote portions of this post, and took the photos for this hike. Thanks, Joe! Parking: Parking area was closed due to 2013 flooding. Trailhead is only accessible by hiking up Baseline trail from a lower parking area. poison ivy: There is poison ivy along the Gregory Canyon trail, so be sure to be careful not to brush up against it. dogs: Boulder’s parks allow approved dogs to be off-leash, but owners must get a voice and sight control tag. For more information, see Boulder’s dog voice and sound control tag page. Hiking Guide: Be sure to download our Dayhike Hiking Guide and Packing Checklist so that you are prepared for this strenuous hike. According to the trail map, I need an off trail permit to complete the hike up to Green Mountain. Is this true? No, the off-trail permit is only required if you are going off the main trails. The summit is accessible by either the Greenman or the Ranger trail. I just want to add that this hike is pretty much all uphill and is very rocky. My boyfriend and I hike just about every weekend and this was very difficult for me. Also I’m not sure if we took a wrong turn but according to my fitbit band, the hike was 9 miles RT. Wonderful hike! Two things to know: 1) The Gregory Canyon Trail is currently thick with POISON IVY. If you don’t pick your way extremely carefully or if you have a dog with you, there will be poison ivy contact. 2) The upper part of E.M. Greenman from Saddle Rock Trail to the summit is CLOSED TO DOGS. You can avoid most of the poison ivy by starting at Chautauqua at the Baseline Trail to Amphitheater Trail to Saddle Rock Trail, then take E.M. Greenman up to the top if you don’t have a dog. Hikers with dogs can take E.M. Greenman down from the junction with Saddle Rock Trail, then pick up the Ranger Trail and take the Ranger Trail to the summit. I hiked (almost) exactly via the trail plan laid out on this page. The trails I hiked were Chautauqua -> Ski Jump -> Blue Bell -> Gregory Canyon -> Ranger Trail -> Green Mountain West (short spur that leads to summit) ->E.M. Greenman -> Saddle Rock -> Amplitheater-> Baseline. Whoo boy was it a work out, but completely worth it with the stunning views (I started at 6 this morning, got some great sunrise shots with my phone’s camera as I was passing through GC). One thing to note, the parking lot at Gregory Canyon is open again. I believe the sign said $5 to park there, but I’m not 100% sure as I only saw it as I was passing through. Love this site! Use it all the time to plan my weekend hikes. I take lots of pictures of the scenery so please let me know if you would like any contributions.